Pustular psoriasis is a subtype of psoriasis that can be extremely debilitating, and, when generalized, life threatening. 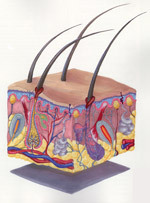 The form that is generalized is known as 'acute von Zumbusch pustular psoriasis'. This case represents the localized form also known as localized palmoplantar pustular psoriasis. Although the surface area of the hands and feet can be far less than 10% of the total body surface area (which means many insurance programs will not cover the cost of some of the needed biologic agents), the palmer/plantar involvement can profoundly affect quality of life issues. There are reports of infections preceding the occurrence of the localized forms. Pustular psoriasis is often extremely resistant to therapy and may need a combination of treatments, including biologic agents, to achieve satisfactory control. Underlying bone changes and psoriatic arthritis is associated with this condition. 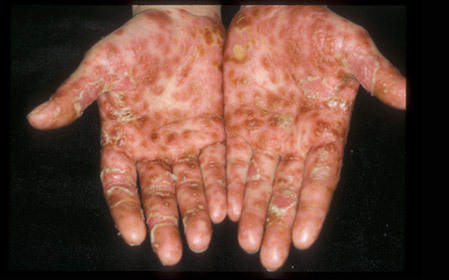 'Acrodermatitis continua of hallopeau' is the term given to the chronic, treatment resistant form of localized palmoplantar pustular psoriasis. 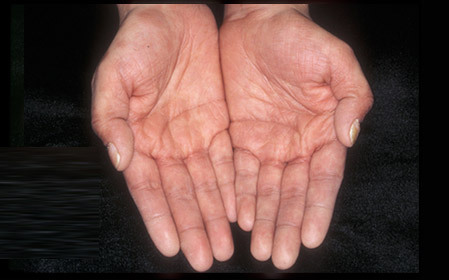 In this particular case, this patient was started on a combination therapy program utilizing: CutiCort Spray, Narrow-band UVB phototherapy, cyclosporine (Neoral) and etanercept (Enbrel). The after photographs were taken 28 days after the initiation of therapy. She was very happy with the treatment results and back to her normal life ( = no more wheelchair). She was seen at follow up over the next 9 months with only minor involvement/flare ups, under excellent control.